ESPN The Magazine is a monthly sports magazine published by the ESPN sports network in Bristol, Connecticut, in the United States. The first issue was published on March 11, 1998. The main sports covered include Major League Baseball, National Basketball Association, National Football League, National Hockey League, college basketball, and college football. The magazine typically takes a more lighthearted and humorous approach to sporting news compared with competitors such as Sports Illustrated and, previously, the Sporting News. Two Way: Stuart Scott answered questions from readers, giving his own opinions. The Biz: Peter King writes about the business side of sports and its effect on the sporting world. The Post: Looking back at the previous edition of the magazine with some of the readers' comments and updates on past stories. Zoom: One large "image of the week," occupying two pages. The Jump: A mix of different regular features, offering an alternative and usually humorous take on the current sporting scene. Outtakes: A transcript of an interview from The Dan Patrick Show with a sport star mostly talking about non sports issues. Interviews now done by Kenny Mayne. The Life of Reilly: Former Sports Illustrated columnist Rick Reilly gives his opinions on the sports world, and reports upon various "special interest" stories in sports. NEXT Athlete: Yearly award given out to young rising star athletes. Athlete X: a feature that ran in the late 2000s where an anonymous athlete from various sports (MLB, NFL, and NASCAR) offered an insider's perspective. Most of these departments and features were dropped after a 2011 editorial change. As of 2016, only Zoom and The Biz still appear regularly. There is also a recurring column that focuses on Sabermetrics, as well as The Truth, a back-page editorial that focuses on controversial topics. The annual "Body Issue", which debuted in 2009 as its answer to the Sports Illustrated Swimsuit Issue, features naked and scantily-clad athletes. The "Body Issue" addresses the physical structure of the most popular athletes to show what parts of their body they see as almost "perfect". ^ "List of Top 10 Best Sports Magazines of All time". Sporty Ghost. March 3, 2015. Retrieved February 12, 2016. ^ a b Michael McCarthy (September 28, 2009). "First look: In ESPN's magazine, showing skin is no issue". USA Today. Retrieved February 1, 2015. The Consensus 2008 College Basketball All-American team, as determined by aggregating the results of four major All-American teams. To earn "consensus" status, a player must win honors from a majority of the following teams: the Associated Press, the USBWA, The Sporting News and the National Association of Basketball Coaches. Amanda Yvette Bingson (born February 20, 1990, in Victorville, California) is an American track and field athlete specializing in the hammer throw. She is the former American record holder in the event with a distance of 75.73 m (248 ft 5 1⁄4 in) set at the 2013 USA Outdoor Track and Field Championships. Bingson attended school at the University of Nevada, Las Vegas where she is a school record holder and majored in interdisciplinary studies. She had only taken up the hammer throw in 2009 as a college freshman and has continued to improve since then. A month before the trials, she finished fourth at the NCAA Women's Outdoor Track and Field Championships. Prior to that, she was a shot put and discus thrower at Silverado High School in Paradise, where her team won the state championship twice and where she finished second in the 2008 shot put.She qualified to join the Olympic team by finishing second in the hammer throw at the 2012 United States Olympic Trials, throwing 71.78 m (235 ft 5 3⁄4 in) (reaching the A standard) in the 4th round. At the Olympics, she did not advance past the qualifying round, finishing 28th overall. Bingson appeared on one of the covers for the 2015 ESPN The Magazine The Body Issue.Amanda Bingson placed fourth in hammer behind Team USA teammates Amber Campbell, Gwen Berry and DeAnna Price at 2016 United States Olympic Trials (track and field) and was an alternate to represent the United States in the hammer at the 2016 Olympics. Anthony Mandler (born April 18, 1973) is an American film director, music video director, television commercial director and photographer. As a music video director, his most notable and frequent collaborator is Rihanna. The two have worked on sixteen music videos together throughout her career, beginning with "Unfaithful" in 2006 and most recently "Diamonds" in 2012. He has also written and directed music videos for many other prominent artists including the Spice Girls, Jay Z, Beyoncé, Eminem, Usher, Shakira, Taylor Swift, The Killers, Selena Gomez, Justin Bieber, 50 Cent, Ne-Yo, Nicki Minaj, Drake, Snoop Dogg, Lenny Kravitz, Cheryl Cole, M.I.A., Mary J. Blige, fun. and Lana Del Rey.Beginning his career as a photographer, Mandler's work has been featured on the covers of major magazines such as Entertainment Weekly, GQ, Esquire, Men's Health, and ESPN The Magazine. His celebrity portraits include, among others, David Beckham, Colin Farrell, James Franco, Heath Ledger, Ryan Phillippe, Eva Mendes, LeBron James, Taylor Lautner, Andrew Garfield, Kiefer Sutherland and Katie Holmes. For commercials, he has worked with international clients such as Nike, Inc., Motorola, Duracell and Cîroc.In film, Mandler was set to make his feature film directorial debut with the film Tokyo Vice based on the Jake Adelstein book of the same name. J. T. Rogers would be providing the screenplay, with Daniel Radcliffe starring in the lead role. Mandler ultimately made his debut with the 2018 film Monster. Robert Stanbury "Buster" Olney III (born February 17, 1964) is an American columnist for ESPN: The Magazine, ESPN.com, and covered the New York Giants and New York Yankees for The New York Times. He is also a regular analyst for the ESPN's Baseball Tonight. He also hosts ESPN's Baseball Tonight daily podcast. ClutchFans is a Houston Rockets fan site, founded by David "Clutch" Hardisty. Originally named Clutch City, the site was developed as a place for Rockets fans to gather and talk about the team, on August 8, 1996. The site provides a plethora of information and discussion about the Rockets' past, present, and future. In response to the fan site's outreach, ClutchFans has received access to Houston Rockets players and personnel as a member of the press. College Sports Information Directors of America (CoSIDA) is the organization that has since 1952 bestowed Academic All-American recognition on male and female athletes in Divisions I, II, and III of the National Collegiate Athletic Association (NCAA)—covering all NCAA championship sports—and NAIA athletes. Corey Jenkins (born August 25, 1976) was an American football player. He played quarterback at the University of South Carolina and was drafted by the Miami Dolphins. He has seen limited playing time in the National Football League and Canadian Football League. Jenkins was a standout athlete at Columbia, South Carolina's Dreher High School, where he was a three sport star. Jenkins was drafted as the 1st round (24th overall selection) by the Boston Red Sox in the 1995 First Year Player Draft. He played four seasons in the Red Sox minor league system before he was traded to the Chicago White Sox. Corey made it to AA ball before getting released in 1999. Jenkins then played football at Garden City Community College where he was a two-time All-American. He then was recruited to play football under Lou Holtz at the University of South Carolina. After two seasons with the Gamecocks, Jenkins was drafted by the Miami Dolphins in the sixth round of the 2003 draft. He played two seasons with Miami and one with Chicago. Jenkins had an article written about him in the May 2011 issue of ESPN The Magazine about a Ponzi Scheme that he was a victim of back in the 1990s at the start of his baseball career. ESPN Deportes La Revista (ISSN 1933-947X) is a Spanish language magazine that focuses on sports from a Hispanic perspective. La Revista translates to "the Magazine", and ESPN Deportes (which means ESPN Sports) is the name of a Spanish-language sports channel. Just as ESPN Deportes is meant as the Spanish language of ESPN, ESPN Deportes la Revista is meant as the Spanish language equivalent of ESPN The Magazine, although it produces original content and covers events throughout the world. 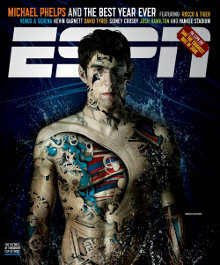 ESPN Deportes La Revista was first published in August 2005. The magazine is published by GW Publishing US LLC with offices in Miami, Florida, Puerto Rico and Mexico City. Federico Flores Navarro is the CEO, Andoni Biurrarena is the editorial director, Jaime Olive is publisher (Mexico), Evaristo Lara is editor-in-chief, Betsie Batista is the advertising sales director, Brenda M. Tabraue-Perez is the circulation and consumer marketing manager, Juan David Cabassa is the Puerto Rico sales representative, José del Valle is staff writer, Mario Chavez Garcia is copy editor, art manager is Rodrigo Galindo, staff photographer is Tom DiPace, Photography director is David Panagua and Alberto Serralde is lead designer. Gene Wojciechowski () is a sports writer, best known for his work with ESPN. Born in Salina, Kansas, Wojciechowski received a bachelor's degree in communications and journalism from the University of Tennessee and began his career as a sports writer covering college football and college basketball. His work has included stints with the Chicago Tribune, Dallas Morning News, The Denver Post, and the Los Angeles Times; he became a senior writer for ESPN The Magazine in January 1998, having worked as a football reporter for the network since 1992. He was named a senior national sports columnist for ESPN in June 2005. James Alfred Joyce III (born October 3, 1955) is a former American professional baseball umpire. He worked in the American League (AL) from 1987 to 1999 and throughout Major League Baseball (MLB) from 2000 to 2016. He wore uniform number 66 for MLB and number 6 while in the AL. His strike call was extremely loud and enthusiastic, similar to that of retired umpire Bruce Froemming. He became infamous for an incorrect safe call in Armando Galarraga's near-perfect game in June 2010. Prior to this, an ESPN The Magazine poll of MLB players called Joyce the best umpire in the game. He also called an obstruction rule in the bottom of the ninth in Game 3 of the 2013 World Series that helped the St. Louis Cardinals to a win over the Boston Red Sox. In 2012, Joyce was promoted to interim crew chief, replacing injured umpire John Hirschbeck. His crew consisted of Jim Reynolds, Mike DiMuro, and James Hoye. Joyce was promoted to regular crew chief prior to the 2013 season. MMA Junkie is a news website that covers the sport of mixed martial arts (MMA). MMAjunkie is owned by Gannett Company. The site and its content have been featured in Time magazine, ESPN The Magazine, The New York Times, Fox Sports Net's The Best Damn Sports Show Period, Fox Report w/ Shepard Smith, Inside MMA, ESPN's MMA Live, Yahoo! and other media outlets. Richard Paul Reilly (born February 3, 1958) is an American sportswriter. Long known for being the "back page" columnist for Sports Illustrated, Reilly moved to ESPN on June 1, 2008, where he was a featured columnist for ESPN.com and wrote the back page column for ESPN the Magazine. Reilly hosted ESPN’s Homecoming with Rick Reilly, an interview show, and he is a contributing essayist for ESPN SportsCenter and ABC Sports. The Sports Reporters was a sports talk show that aired on ESPN at 9:30 a.m. ET every Sunday morning (and replayed at 10:30 a.m. ET the same day on ESPN2 and 11:30 AM on ESPNews). It featured a roundtable discussion among four sports media personalities, with one regular host and three rotating guests. The show began in 1988, patterned to some extent after the Chicago-based syndicated show called Sportswriters on TV. ESPN Deportes, ESPN Latin America and ESPN Brasil may launch Spanish-language and Portuguese-language versions of the show in the future.The show was originally broadcast from a studio in Manhattan, and from 1999 to 2010 it was recorded at the ESPN Zone at Times Square in Manhattan before it closed. It then moved to Bristol, Connecticut at the main ESPN studios, where it stayed until the end of its run. On January 23, 2017, ESPN announced its planned cancellation, following the death of host John Saunders. The final episode aired May 7, 2017. The show would return in the form of a podcast in September 2017. Timothy Bell Kurkjian (; born December 10, 1956) is a Major League Baseball analyst on ESPN's Baseball Tonight and SportsCenter. He is also a contributor to ESPN The Magazine and ESPN.com. He guests on Golic and Wingo on Thursdays at 7:44 a.m., discussing the latest in happenings in Major League Baseball. He is a frequent contributor to Buster Olney's podcast. He also appears regularly on The Dan LeBatard Show and The Tony Kornheiser Show.